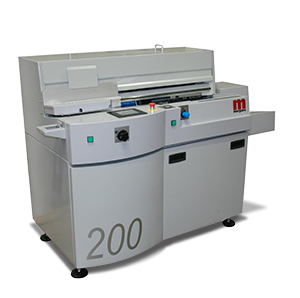 The DigiBook 200 perfect binder is suited to traditional and digital printers who require short to medium runs of PUR perfect bound books to a professional standard. The DigiBook 200 is equipped with a patented closed gluing system where the spine and side gluing is automatically applied by a slot applicator for the utmost binding quality and accuracy. PUR is the strongest, most flexible binding adhesive available and offers several additional advantages over other binding adhesives. When inks, coatings or digital print toners are present in the spine area these can compromise the strength of typical hotmelt perfect binding. PUR is resistant to this and will form a super-strong bond with all weights and finishes of paper stocks. In addition PUR works well with synthetic and recycled-content stock.